Women who want a unique look to their bridal attire might want to consider 1940s vintage wedding dresses. Both classic, practical dresses and elegant dresses from that era are available at resale, consignment, and vintage shops. Women's fashions of the 1940s are divided in two parts: during the war and after the war. Wartime rations called for simple designs and borrowed dresses, while the New Look ushered in a stylish and feminine approach to style, especially with the boom in weddings after the troops returned home. 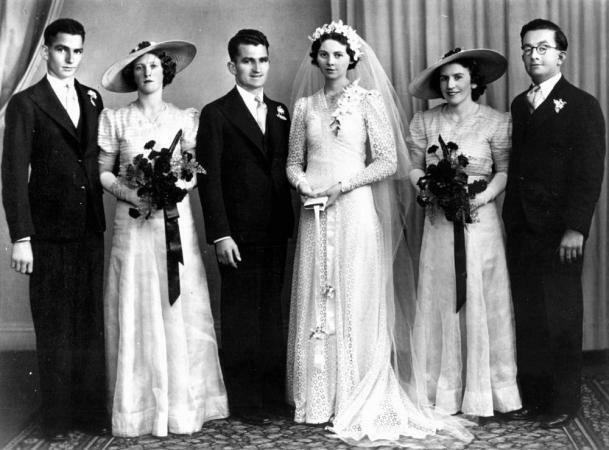 The fashions for weddings during the first half of the 1940s were limited by war rationing. Both food and clothing were rationed across the UK and U.S. For this reason, many brides in the early 1940s of modest means ended up wearing practical dresses. Utility clothing in Great Britain was typical civilian wear, so women often borrowed dresses from others or wore their best dress. They would "mend or make do" with whatever was available. Suit styles were popular both in the U.S. and overseas. In 1947, after the end of WWII, Christian Dior debuted a line of clothing called Corolle, which was called the New Look by Life Magazine. The line took advantage of the more readily available fabrics and brought attention to the form of a woman's body, with tighter waists and full skirts. The more feminine and stylish fashion stayed popular from the late 1940s through the 1950s and is evident in many 1950s wedding dresses. The first place to look for a vintage wedding dress is in a grandmother's bureau. Older female relatives may have saved their wedding dress, especially if it was a more glamorous design. Also check consignment shops, vintage and antique clothing stores, and online auctions. Mill Crest Vintage - This online bridal shop specializes only in vintage wedding dresses, so it's a great place to get started. They separate dresses by decade and include full descriptions and dress condition. They have over a dozen authentic 1940s wedding dresses available as of this writing, ranging from short-sleeved styles in eyelet to long-sleeved designs with Swiss lace. Etsy - A variety of sellers on Etsy have wedding dresses from this era, including simple styles and ones with fuller skirts of the later part of the decade. Prices vary, from under $100 to over $800. Vintage Vixen Clothing Company - This is an online boutique dedicated to vintage clothing and accessories. Although the specific dresses available will vary, the shop has hundreds of vintage items, with a focus on ladies' wear. The retailer does include a full description of each item, as well as the time period and in some cases even which part of the decade it's from. Davenport & Co. - Another shop that specializes in vintage clothing, Davenport & Co. has a specific section for vintage wedding gowns. To place an order, browse the online catalog and contact the company via email with the catalog number for the dress you are interested in purchasing. Shipping costs vary by item. Shipping costs vary by item and location. Wildrose Vintage - This vintage shop is based in Canada, but does ship to American customers. They specialize in vintage clothing, especially women's dresses. Their current stock includes a New Look era wedding gown done in Chantilly lace. Unique Vintage - This shop has a separate section for weddings, with sizes ranging from XS through 5XL. Most prices range under $100 to just over $400, and you can sort by era. The store's 1940s-inspired looks include short-sleeved and long-sleeved designs in mostly mid-lengths. Modcloth - While this shop doesn't specify the era of their vintage-inspired dresses, they have nearly two dozen different designs to browse from. Some, like the Dream Celebration Fit and Flare Dress with its sweetheart neckline, have elements of a 1940s look. Dresses range from about $100 to $300. Size availability depends on the dress, but most styles come in sizes 2 through 26. Choosing authentic 1940s vintage wedding dresses does pose some problems. 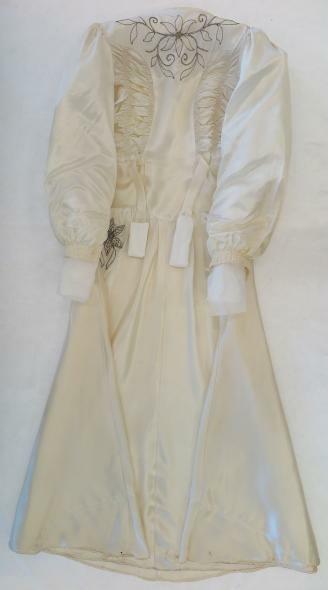 Some may not have had proper wedding dress preservation techniques used on them, making them too delicate to wear. Yellowing, fading and stains are also common problems with dresses from decades past. Sizing information is often different from today's generous cuts, so get accurate measurements or try on the gown if possible. Be sure to investigate any vintage dress thoroughly before purchasing. Sewing a wedding gown using a wedding dress pattern is another way to obtain a vintage 1940s style dress. Using new materials, pick out a pattern that will compliment a 1940s themed wedding and make the dress personally or hire someone else to make it. Patterns can be found online at stores like So Vintage Patterns. Military couples might embrace the war-era utilitarian look, with the groom wearing his uniform and the bride in a similar suited dress. Brides can also choose to wear a more classic wedding dress that features styling elements from the 1940s. Look at vintage dress styles real brides were able to find for ideas, such as this bride who styled the 1940s wedding of her dreams (she found her dress on eBay). Consider modern styles inspired with elements from the 1940s. If you are looking for a dress from the early 40s, browse sections of modest dresses at mainstream bridal retailers for possible styles. 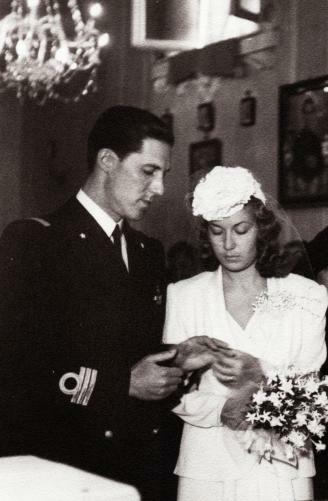 Bridal gowns in the 1940s were a reflection of the war. 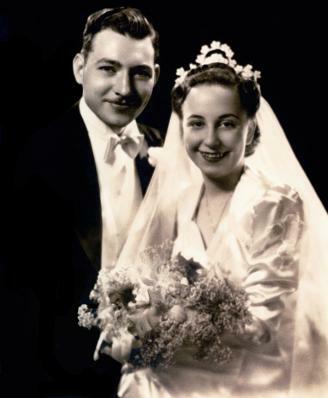 From modest wedding dresses that were simply the best suit in her closet to more elegant dresses made of cheaper fabrics like rayon, the 1940s bride still wanted to look beautiful on her wedding day.